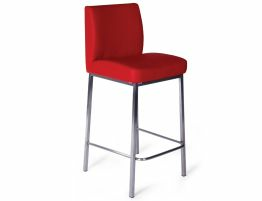 The Balin is a gorgeous bar stool for your sleek, modern kitchen. The Balin modern counter stool gathers inspiration from geometry to create its sleek frame and tufted cushions lend this stool a softness and comfort. Create a tailored, contemporary look in your kitchen or counter seating space with the pared down to the essence form of these brushed stainless steel bar stools. This is a well built barstool that will provide years of everyday use with its stainless steel legs and frame, a great mix of looks and strength and a foot rail provide stability and comfort. 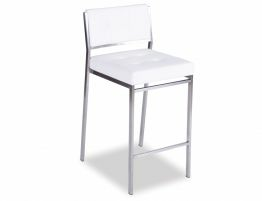 Our Bali barstool offers a padded, cushioned seat and back that offers seating comfort and is upholstered in a white material that offers the look of leather in a stain resistant, fade resistant and easy to care for material. 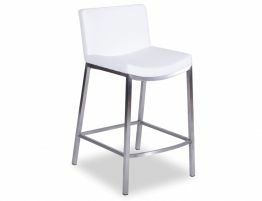 Our modern white upholstered and stainless steel bar stool offers an on-trend update for your home with its tufted white seat and back and gleaming brushed stainless steel frame, this counter stool looks pricey. 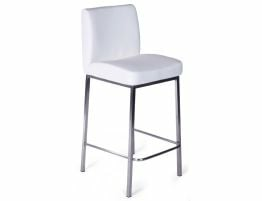 Pair this modern white bar stool with your new granite breakfast bar or update your kitchen barstool for an instant kitchen makeover. 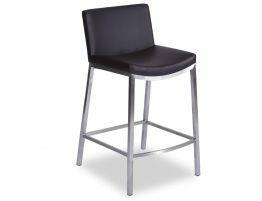 Our Balin designer bar stool offers stainless steel construction and a comfort driven padded seat.